Thank you for the tulips. And it's all okay. I'm still here. You do what you gotta do and we will rejoice when we can all get together in this space. In my opinion there is likely no desk that is beautiful, except a totally impractical one, like one that is a roll-top desk and has a lot of cubbyholes that are too small to hold anything. Or a desk made out of the wood from a famous ship. Would you be able in good conscience to store your yarn in The Resolute Desk? The first thing to go is the house... ;-) As I can totally attest. And it's okay. The tulips are gorgeous! Congrats on the desk score. And yes, we'll still be here. I totally understand the juggling that working outside the home, household chores, family time, you time, blogging, etc. requires. Nice to see you are still alive!! best of luck with everything. So good to hear from you. Good laughs here, as always. Meth-house desk is a great new catch phrase. We drove to Florida for part of spring break. I like to leave my house nice and clean. This time I had to settle for get-to-it-when-I-get-back. Also known as disastrous. Or maybe I just won't go back. There is sun and warmth and sand here. 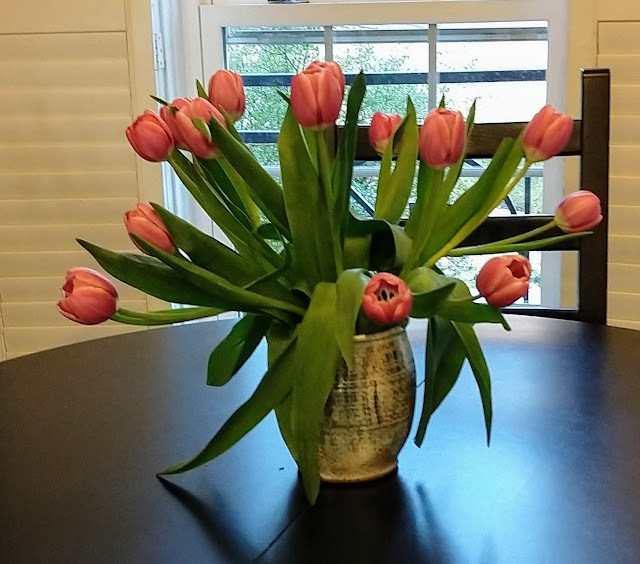 Tulips for the win! I love tulips and even when everything else is less than I would like, a big bouquet of tulips makes me feel like I have it all together. I'm glad things are going well with work! And it feels like we've also had the wettest fall and winter ever around here. We've had some sun this week and it has been such a great morale booster!! LOL that's about the level of my house keeping now. Not disgusting. But I'm failing that in a few spots. It's been raining here forever too. STOP RAINING. We had one beautiful day last weekend and everyone was wearing shorts and flip flops. Apparently those are readily available when you live in CA lol. Meth-house desk is everything awesome about your writing. Sometimes the idea of cashing it all in and moving, taking nothing more than a duffel bag, really appeals to me, too. I keep dreaming about downsizing, but then I remember the kids still live here. The bar was lowered long ago in our house to "not disgusting" and lately that bar is still too high. On the upside I'm about to publish a new novel with another on its heels soon. I'd rather write than clean, and it shows. It takes me 2 minutes and 30 seconds to microwave oatmeal, and I dedicate that time to cleaning whatever has been left in the sink. Not disgusting is a high enough bar . . . as long as everyone has been vaccinated. I'm going to be saying this all weekend. Also? You deserve a desk that isn't covered in drug residue. You're worth it! Could you, pretty-please-with-sugar-on-top, send me pictures of the meth-house desk? Because I'm a little afraid that it looks like ours (our desk, not our meth-house) and I need some reassurance. "You just want me to be perfect!" Or...why our garage looks like it does.